VANCOUVER - Indigenous groups in Canada and the United States are calling for a study of how human activity has degraded the waters off British Columbia's coast before any new vessel traffic is allowed in the area, where port and pipeline activities are on the rise. 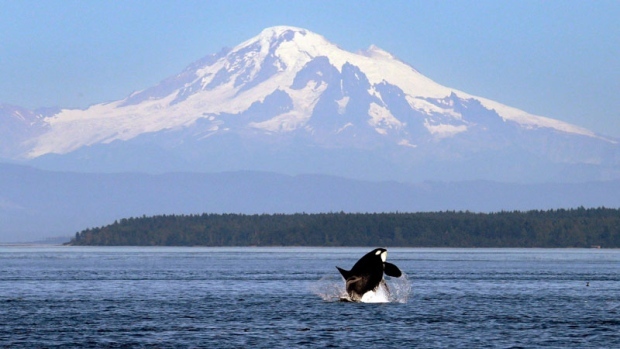 "We're Coast Salish nations that have come together from both sides of the border with the United States and Canada to address this urgent issue that's happening to our Salish Sea," Raynell Morris of the Lummi Nation said Wednesday. The Federal Court of Appeal quashed the Trans Mountain project's approval in August in part due to the National Energy Board's failure to consider marine shipping impacts. "To me it's like the canary in mines. The animals are going and it's happening and it's not going to be too long before it's affecting all of us," George said. The groups did not rule out demonstrations if U.S. and Canadian authorities refuse to conduct a study, with Morris saying they would protect the land and sea "by any means available and possible and necessary." The Indigenous representatives spoke during a break at an information session held by the Canadian Environmental Assessment Agency's review panel on the proposed Roberts Bank Terminal 2 project. Cliff Stewart, vice-president of infrastructure for the port authority, said demand has been increasing on Canada's west coast for all types of shipping over the past couple of decades. The average growth in demand for container volume alone increases eight per cent each year, he said, which is why the port authority proposed building the new terminal. "But given the volume that now is coming in through the west coast, even a three per cent growth is a significant amount of containers each year," he said. "The way that environmental assessment methodology works is you look at the impact of a particular project and if there are residual impacts after mitigation, then you have to look at the cumulative effects of that particular effect," Stewart said.